Thankfully in Tenerife we dont have incidents relating to divers being left behind, however in some Countries, it has become a real problem! 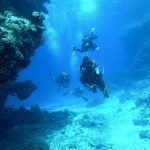 So what do you do if left behind whilst diving? Check out the tips below. 1. Do a 360. If you come up and the boat is gone, turn a full circle, scanning the horizon for land, other boats or anything you could cling to. If safety is close, drop your weights to swim on the surface, but keep your mask and regulator/ snorkel intact. 2. Send up a signal. Every diver should have a surface- marker buoy, a signal mirror and an audible signal that connects to your low-pressure inflator. Use the mirror and audible alert if you see someone. A better solution is to carry a GPS beacon like the Nautilus Lifeline. 3. Conserve energy. If you have to swim for shore against the current, dont swim directly into it. Fighting a current is a fast way to burn energy. If you must swim against the flow, go diagonally or perpendicular. 4. Stay warm. Even with a wetsuit, extended time in the water can sap your body of heat. You can conserve body heat by hugging your knees to your chest. 5. Keep calm, but prepare to fight. Not only can thrashing lead to drowning, it also alerts sharks. Take deep breaths, and make intentional movements and decisions. If the sharks show up, be prepared to defend yourself by punching. Posted in: Dive and Sea Teneife.